He said he is not involved in any fraud, adding that he did provide some consultations. He did not say who exactly who the client of his services was. When asked if he is prepared to put down his Saeima deputy’s mandate in the event of criminal prosecution, Zakatistovs said he is the in the process of considering his options. Corruption Prevention and Combating Bureau (KNAB) has requested the prosecutor’s office to prosecute Zakatistovs and businessman Viesturs Tamužs for large-scale fraud, according to information from LETA. It was uncovered during the investigation that fraud may have taken place in the interest of some legal person, as reported by KNAB. KNAB continues the investigation in the criminal process, in which 13th Saeima deputy Artuss Kaimiņš was made a suspect. He was suspected of illegal financing of KPV LV political party. Previously a similar status was applied to Zakatistovs and Tamužs. 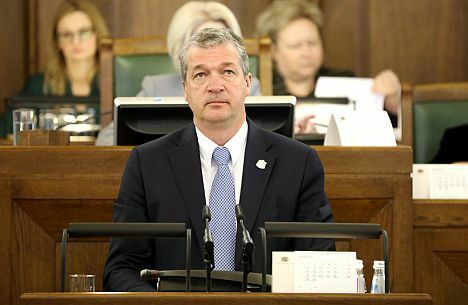 KNAB chief Jēkabs Straume told Latvijas Radio programme Krustpunktā confirmed that the investigation in the aforementioned process continues in relation to «one more private person».